Haight congratulates Chris Kendrick and Valerie Moore who were selected for JD Supra’s 2018 Readers’ Choice Awards for excellent writing in Insurance law. JD Supra’s Readers’ Choice Awards recognize 26 firms and over 240 authors (from among 50,000) who published their excellent thought leadership on their platform last year. 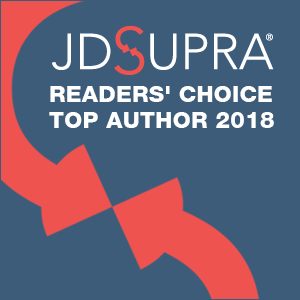 These awards reflect a deep dive into JD Supra’s reader data in 26 established categories, including healthcare, cybersecurity, employer liability issues, product liability, real estate, finance & banking, and others. They also recognize top visibility in eight emerging topics during 2017 (such as GDPR, Brexit, CFIUS, artificial intelligence, and others). With great pride in all of the excellent thought leadership on JD Supra, and the particular achievement of the authors and firms in these categories, I send you onward to the 2018 JD Supra Readers’ Choice Awards. For direct access to highlights for Chris Kendrick and Valerie Moore, please click here.